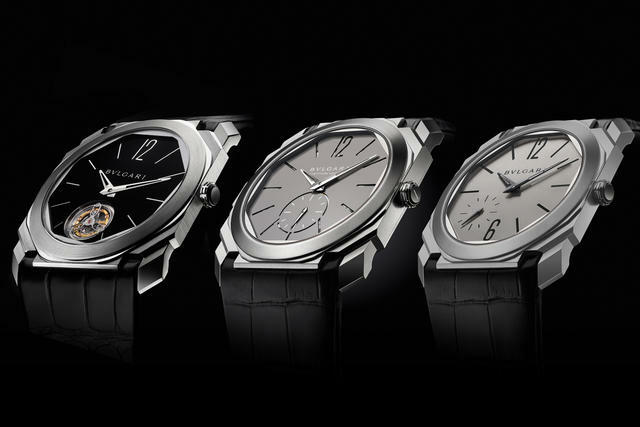 Bulgari’s ultra-thin timepiece trifecta garnered considerable attention at Baselworld 2017. Three years after debuting the thinnest tourbillon (the Octo Finissimo Tourbillon), and just a year after showing the world’s thinnest minute repeater (the Octo Finissimo Minute Repeater), Bulgari this year expanded its ultra-thin bona fides with a third title holder, the Octo Finissimo Automatic, now the thinnest watch available operating with an automatic movement. Measuring just 5.15mm thin, with an in-house caliber BLV138 movement comprising only 2.23mm of that total, the 40mm diameter sandblasted titanium watch is a lightweight, highly refined work of Italo-Swiss design. The watch’s case design retains the Octo’s sophisticated circle-over-octagon bezel and case profile, which clearly identifies the watch as the youngest member of the sleek Octo Finissimo family. 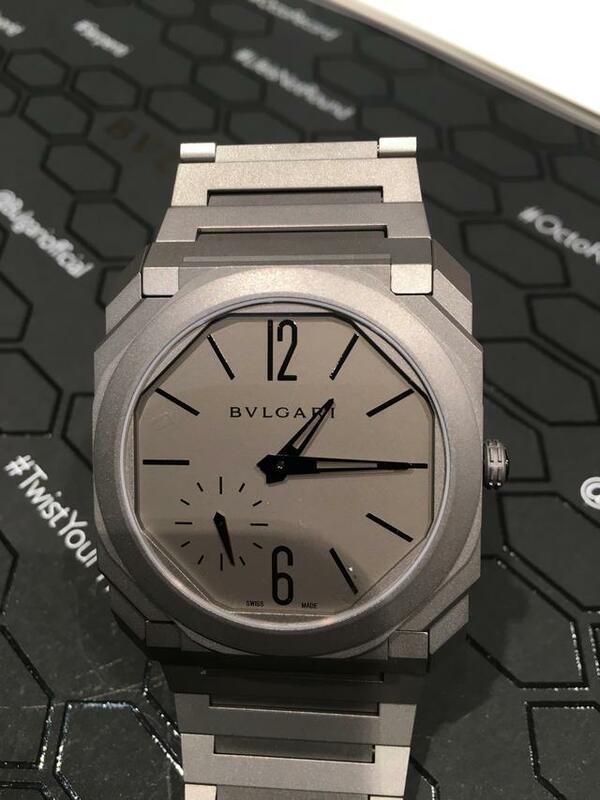 But unlike late year’s repeater, which saw Bulgari cut slits into the dial to enhance the chime’s sound, this watch bears black PVD markers and numerals on its titanium dial to ensure peak legibility. 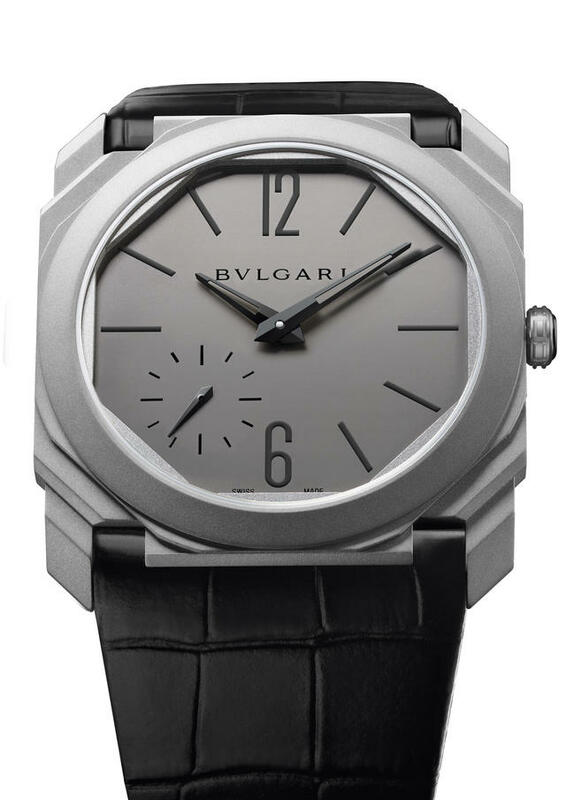 The dial’s small offset seconds subdial (directly connected to the seconds wheel underneath) underlines Bulgari’s well-considered design sense. On the wrist, the Octo Finissimo Automatic is a vivid dream¬. It’s barely felt given its thinness and feathery weight, yet it is not forgotten, in part because of its 40mm diameter and sculpted case. When on your wrist attached to its titanium bracelet, it feels like post-modern architecture or art. The leather strap is luxurious and also lightweight, but visually a bit wide for my wrist. With the bracelet, the entire package seems more complete. 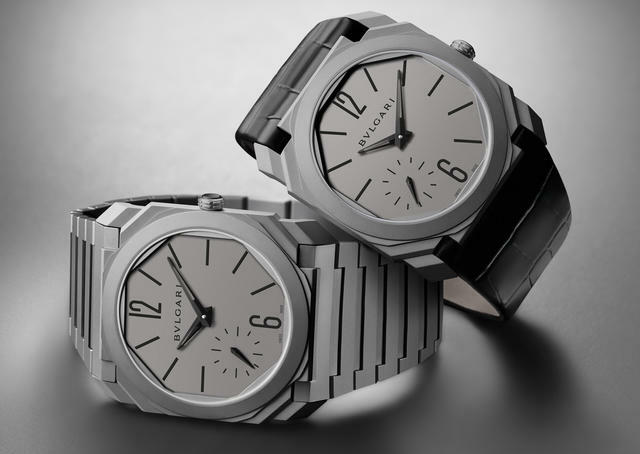 Bulgari’s Octo has emphasized the Roman-influenced focus it placed on Gerald Genta’s precursor since the brand renewed Octo more than five years ago. Its round bezel inside an octagon case, set above stepped lugs, is complex, and here invoked on a far slimmer scale than most other Octo-cased models. 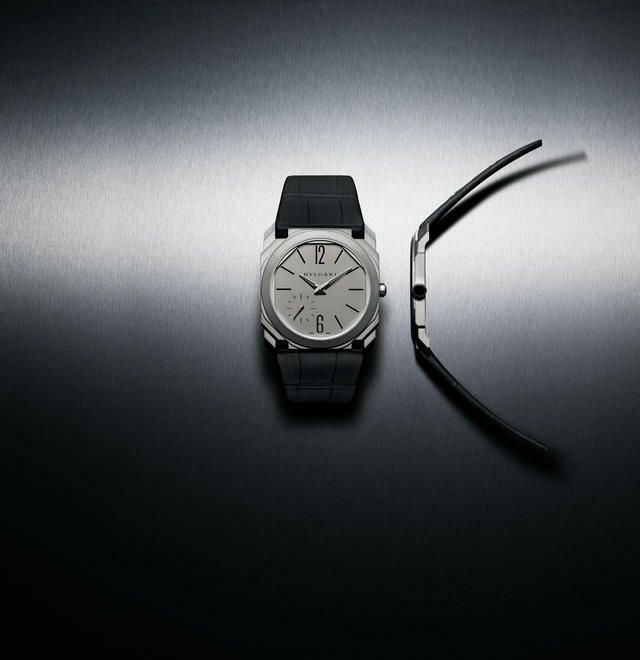 Yet even with this series of ultra-thin watches that require far less actual case material, Bulgari has been careful to retain the Octo’s sense of depth and perspective. This is exactly why, when this watch is worn, your eyes are repeatedly drawn to your wrist. What they will see, beyond design, is of course serious Swiss watchmaking. Using a platinum rotor and with a 21,600-vph rate, the watch boasts a 60-hour power reserve. 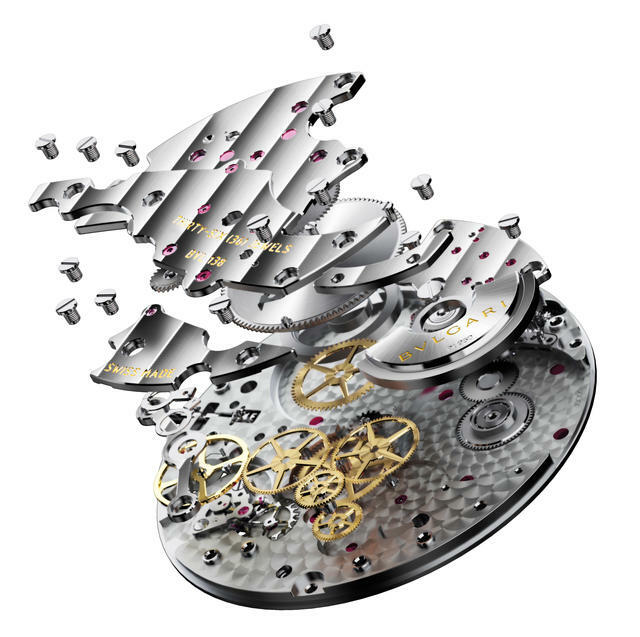 The movement, visible from the back, is hand-decorated exercise in minimal gearing with four bridges placed amid expertly applied Côtes de Genève and circular-grained finishing. A simple ceramic inlay decorates the titanium crown. Movement: Mechanical Manufacture movement with automatic winding via a platinum micro-rotor; Caliber BVL 138 Finissimo, decorated with Côtes de Genève finishing, chamfered bridges and a circular-grained mainplate; 2.23mm thick, 36.60 mm in diameter, 21,600 V/H, 60-hour power reserve. Case and dial: 40mm case in sandblasted titanium, transparent case-back, 5.15mm thick; titanium crown with ceramic insert; water-resistant to 30 meters; titanium dial, black hands with PVD treatment. Bracelet/Strap: Titanium bracelet with folding clasp or black alligator leather with titanium pin buckle. Prices: $12,800 (leather strap); $13,900 (titanium bracelet).